(CNN) — A former mining tycoon accused of running a “mafia-style” gang to amass billions of dollars in personal wealth has gone on trial in China, facing charges including murder, state media reports. Liu Han was former board chairman of the Sichuan Hanlong Group, the largest private enterprise in the southwest Chinese province of Sichuan, with interests including mining, real estate, electricity, energy and finance. He also holds major stake in a number of Australian companies. Official Chinese news sources estimate his wealth, which was seized with his arrest, as in the “tens of billions of yuan,” or billions of U.S. dollars. The 48-year old, who was detained last year along with younger brother Liu Wei on suspicion of criminal activities, has been charged with a raft of crimes, including murder, financial crimes, operating casinos and gun-running, according to state news agency Xinhua. The trial against the brothers and 34 of their associates began in Xianning Intermediate People’s Court in Hubei Province Monday,when a photograph of Liu Han in the court’s dock, flanked by policemen, was published on social media networks by state news agencies. Details of the charges against the alleged gang — including nine murder charges — were carried in a Xinhua report in February. The report said the brothers’ empire grew, before finally attracting the attention of central authorities with an alleged public shooting at a Guanghan teahouse one afternoon in January, 2009, supposedly directed at an underworld rival. According to the report, the two suspects detained over the attack, which killed three and injured two, allegedly identified Liu Wei as having ordered the attack. Liu Han also developed a reputation as a philanthropist, building a rural school campus following a 2008 earthquake that devastated Sichuan Province. His brother also had a reputation for charity, and had been a torch-bearer in the build-up to the Beijing Olympics, also in 2008, according to Xinhua. Large numbers of senior Communist Party officials are reportedly attending the trial, which is being closely watched for any signs of links to a potential investigation into former senior official Zhou Yongkang. The 71-year old was a member of the Politburo Standing Committee, China’s top decision-making body, before he retired in 2012, and previously served as the czar of China’s domestic security apparatus, and as the party chief in Sichuan from 1999 to 2002. Speculation has swirled in recent times that Zhou is set to become the next high-profile target of President Xi Jinping’s heralded anti-corruption purge. 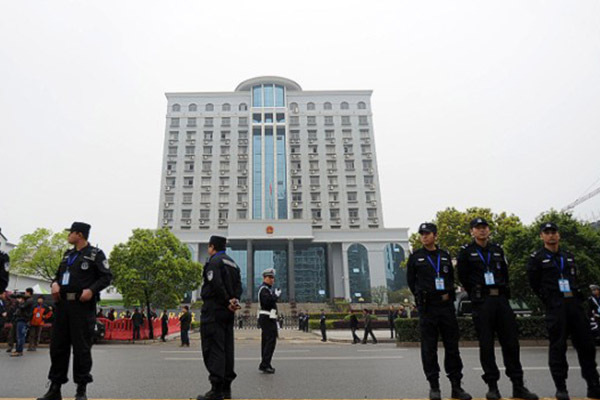 Chinese state media has hinted that Liu Han’s alleged gang operated with political connections to central government officials.